There is also an English corner on Saturdays at 2:30-5:00 pm at the Guizhou Provincial Library 贵州省图书馆 (Beijing Road 北京路), on the 4th floor in the foreign language book collection section. The Protestant church on Qianlingxi Road 黔灵西路 occasionally also has an English corner on Tuesday nights. And there is an English corner in a Korean restaurant in a shopping center in Jinyang. In 2004 I was teaching at Guizhou Normal University and the Waiban (Foreign Affairs Director) sponsored a trip to a Miao village outside of Kaili in the southeast of Guizhou. We were forced to drink the wine (a sweet, rice based wine), listen to singers, watch dancers, look at the fantastic scenery, and so on. If you tried to resist the wine, they made you drink another cup. A fine time was had by all. American education delegation visit to Guiyang, 2007 — Mao-Mart: Always Low Prices! This morning we visited a middle school affiliated with Guizhou Normal University. We were met at the gate by the school’s principal. The school actually placed a banner in English and Chinese at the gate welcoming us, as well as in the reception room. The principal mentioned that today was an auspicious day – 17th day, 7th month, of the 7th year – all those sevens, very lucky indeed! The school has a total of 3,000 students and 200 faculty and staff. At this point, the principals ‘speech was typical of these sort of government sponsored events (very Party like) – he emphasized the similarities and differences between the American and Chinese systems of education – like yin and yang, he said. China emphasizes the group, while America focuses on individual. The principal went onto say that both countries have the opportunity to learn from the strengths of each other. Interestingly, in the middle of his introduction speech, the principal’s cell phone rang and he took the call (a common occurrence at these events). He never lost his place and continued with his speech after finishing the call. He then concluded by stating that the school builds on traditional approaches but also looks forward to the opportunity to meet and learn from educators from abroad. Afterward, we broke out into happy applause (although I was wondering if we would be given any information of substance – it wasnt ‘looking too good). We then got another welcome from the Chair of the Foreign Affairs Office in Guizhou, Miss Chin – “welcome on behalf of the Foreign Affairs Office,” she said, and then told us she is very busy getting ready to leave for a trip to the United Kingdom later in the day. With that, she got up and left. These introductions were looking very “official” – meaning useless in terms of learning anything of substance. We then met with Mr. Zhou, the Director of Education for the province of Guizhou. He proceeded to supply us with a variety of statistics on Guizhou schools: by the end of 2006 they had 470 million students (not sure if that is accurate). They also have 40,00 primary schools, 1,500 middle schools, and 482 senior middle (high) schools (Again, these statistical figures are always suspect). Mr. Zhou stressed that the goal of education in Guizhou is to meet the needs of all students – fairness is the goal. He also emphasized the need for curriculum reform and quality education. Al right, at this point, I am beginning to think that we are being given a very typical Party speech – although not presenting us with all “sunshine and roses,” the speech was less informative than the education related presentations we have heard elsewhere. It isn’t enough to keep repeating the “equality and fairness” phrase over and over. Given what we have learned about migrant families and the plight of “left behind children,” the rhetoric we received today seems a waste of time. I think the old fashioned approach to meeting with foreign educators still practiced in Guizhou reflects the degree to which the province has not met the sophistication level we experienced elsewhere, especially Beijing. They still need to break from the routine of the past and the practice of presenting the rhetorical Party line (Beijing presentations also promoted party policy, but did it in a way that was not always obviously Party rhetoric). Well, I’m not so sure how useful this meeting was. Nevertheless, they had great snacks! I also had a chance to meet with and talk with a high school student, a miss Xue Shuyu. She had lived in America for a year in Pennsylvania where she went to school and took here classes in English. I was astounded at her level of intelligence and her commitment to her studies. All of the students that were present seemed to be of a similar character. It made me think that in the United States we are not doing enough – our students will find it difficult to compete with these young people in a global market place. If we don’t reform our education goals, it is potentially possible that we will fall behind. However, Miss. Xue also admitted that the one problem faced by students in China is the overwhelming amount of study and preparation they are required to do for school. She would have preferred some sort of balance between study time and free time. She particularly liked how in America she had some choices and freedom to study topics of her choosing. This is not always an option for students in China. perhaps Miss Xue, and others like her, may build a bridge between our two systems, making it possible for Chinese students to experience the best of both systems (now I’m sounding rhetorically Party like). Following lunch, we headed towards a section of Guiyang where Professor Belsky had noticed a giant Mao statue. 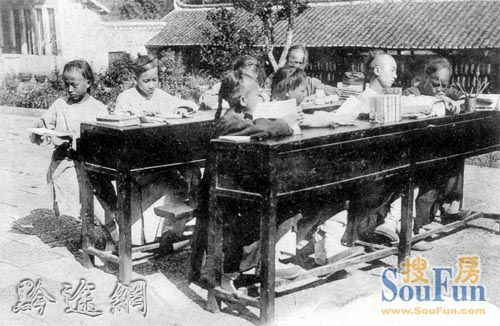 These were common during the Cultural Revolution, but most had been taken down in the years following that controversial period of Chinese history. So, off we went in the bus to check it out. Upon arriving, it was apparent that the statue was very large — it was the largest I have even seen. Interestingly, it now sat in front of a new skyscraper/office building. Both the building and the Mao statue faced in the direction of the main park located in Guiyang along the water front area of the Nanming River. However, on closer inspection, the park was more than a park. At both ends the park there was a triangular structure composed of glass emerging from the grassy area of the park – they looked very much like the I.M. Pei designed entrance way to the Louvre in Paris, France. However, these two pyramid structures were not entry ways into a museum. No, in fact, they were the entry ways into one of the world’s largest Wal-Mart Supercenters! The entire structure was underground, essentially the full length of the park itself, the green lawn being located on the roof of the structure. It was massive and inside one could buy all things one expects to find at a Wal-Mart and more. Chinese tastes for food are different than in the United States. As a result, different varieties of food are available. However, the Chinese do not differ in the desire to purchase items at an affordable price. Hence the smiley-faced Wal-Mart discount signs everywhere. The irony of this discovery wasn’t so much that Wal-Mart was taking over China just like it is America, but that the location of the structure is opposite a giant Mao statue. The man must be spinning in his grave – all that revolution and Mao has to stand for eternity staring at a Wal-Mart Supercenter (makes one consider the hypocrisy of kicking Starbucks out of the Forbidden City – no one seems to care about the sanctity of Mao, especially if it means cutting off access to “Always Low Prices!”). Following our adventure at “Mao-Mart,” We were taken to visit a local industry – a drug manufacturing factory. The name of the company was Li Shuan Gyao Ye and they manufactured a drug that basically acts like a sore throat remedy. According to the director, the drug is completely made of natural herbs, as opposed to Western medicine, which often uses chemicals (I am not sue that his statement is 100% true, but it reflects the Chinese perception of Western medicine). They even gave us a free sample box to keep. Sorry, no photo were allowed so I cant show the plant. It was remarkably clean, especially since the part of the city where this factory was located was not. After our tour, we headed back to our bus, but not before passing a company bus with the image of a famous spokesperson (a comedian). We then took our obligatory group photo. After the company visit, it was time to head back to the hotel for some well needed rest. Guiyang, July 28th, 2013 – The workshop of the Council of the Confucius Institute Headquarters was convened in Guiyang. Mr. Li Jun, Vice Secretary of the Guizhou CPC Provincial Committee; Mr. Zhao Qizheng, dean of the School of Journalism and Communication at Renmin University of China, the former chief of the State Council Information Office; Madam Xu Lin, Chief Executive of Confucius Institute Headquarters, Director-General of Hanban; Mr. Li Zaiyong, Deputy Secretary of the CPC Guiyang Municipal Committee and Mayor of Guiyang City attended the workshop and delivered speeches. In his speech, Mr. Li Jun thanked Confucius Institute Headquarters for organizing the workshop in Guiyang. He said that an important reason for holding the workshop in Guiyang was that Guiyang has got the Hall of Confucius Study. The Study is more a school than a “temple”, which mainly serves as a venue for lectures, research, and training. And the purpose of the Hall of Confucius Study is not to restore the ancient ways but to revive and pass on the elements of the outstanding traditional Chinese culture under new historical circumstances, and to help realize the “China Dream”. He hopes friends from various countries often come to Guizhou, offering their care and help to the Hall of Confucius Study in Guiyang, which makes greater contribution in promoting traditional Chinese culture. Madam Xu Lin pointed out that Confucius Institutes are flourishing and warmly welcomed in various countries, and have been in a new phase of development. Improving the quality of management, upgrading training for local Chinese language teachers, and implementing the Confucius China Study Plan are the basis for the sustainable development of Confucius Institutes, which enables the pursuit of development on a higher level, helps to integrate into foreign universities and local communities, and better serves the demands of the world in learning Chinese language and culture. During the opening ceremony, Confucius Institute Headquarters (Hanban) and the Guiyang municipal government jointly signed a framework agreement for strategic cooperation. During the conference, Mr. Zhao Qizheng gave a lecture about the differences and similarities of Chinese and foreign cultures, and the Chinese and foreign discourse systems. Representatives from countries including the U.S., the UK, Germany, Spain, Australia, Kenya, Brazil, and Chile made discussions and exchanged views about how the Confucius Institute can better integrate into foreign universities, better serve the public of various countries, increase its influence, and they offered advice on how the Confucius Institute could maintain a sustainable development as well. The public lecture provides a platform for communication between scholars and the public. Also, it is part of the cultural development plan of Guiyang,” said Zhao Qizheng, the president of the School of Journalism, Renmin University of China. University representatives from the US, Great Britain and South Korea watched the Chinese traditional coming-of-age ceremony at the Guiyang Confucius Institute on July 30. The ceremony has three sections: a capping ceremony, a hair-pinning ceremony and a shooting event. A total of 50 boys and girls dressed in Han costumes participated in the ceremony. “The Guiyang Confucius Institute’s architecture is amazing,” said Fred Hillmer, the president of the University of New South Wales, Australia. Seven years ago, the University of Edinburgh established a Confucius Institute. Now, it has more than 2,000 students,said Timothy O’Shea, the president of the University of Edinburgh. 28 September is the 2563-year old Confucius birthday, the first Confucius Classroom in Guiyang Huaxi Wetland Park was completed, the school set ritual, ceremony, classical education, Guoxue Tourism Forum, cultural industries and functions as a ‘public Guiyang friends about literature, reading classic study of Chinese culture, learning, I can appreciate the unique beauty of Huaxi Wetland Park. The Guiyang Municipal Party Committee Propaganda Department, Deputy Minister, the Confucius Classroom Management Director Hou Nan told reporters Kong Xuetang functional orientation: ‘heritage and carry forward the Confucian Temple, enlightenment and open a new wind-base’ ritual, collection, research, enlightenment , six arts five basic functions, as far as possible, to the civil and moral education, ideological and moral education of minors and the public a wide range of spiritual and cultural needs. Xuetang Kong, to build a platform of Confucian Studies in Guiyang to meet, play features a respected Confucianism to promote the transfer of Chinese cultural exchange the results of the study of Confucianism, the Confucian heritage and dissemination. Worship, rituals, songs, recreation, tourism, culture, economy, and other functions as one of the community projects. The school building complex covers an area of ​​130 hectares, with a total construction area of ​​nearly 20,000 square meters. Architectural design for the architectural features of the Han and Tang style. Taken the traditional interpretation of the type system was a vertical and two horizontal triaxial networking ‘trend. vertical axis is the ‘ceremony axis’, a symbol of the core ideas of Confucius’ Rites’ and’ benevolence ‘lattice Stargate, Dacheng Hall, Xingtan building two horizontal axis wind axis row axis’,’ wind axis’ a symbol of enlightenment thought of Confucius , lecture group who teach college Khe Sanh, Six Arts Xue Gong, wave ‘a symbol of wisdom and practice of Confucius, Xiangxian for discussion during the conference and scientists to give lectures and learning base. Temple, Yangming Temple, Cravens Court building for worship Guizhou, the ancient sages and celebrities collections Confucian culture classic. Brother John’s place in Huaxi has some very interesting menu items. This is a a short interview with him. Food in Guiyang mainly constitutes Qian cuisine and local snacks. Qian (Guizhou) Cuisine tastes numb and spicy, which are two indispensable elements in Guiyang food. Numb refers to the condiment made from several spices and the spicy is mainly refined from the red pepper. The cheapest snack in Guiyang. Actually it is a thin pancake made of flour and stuffed with various vegetable strips such as the carrot, radish, celery and others. The most popular snack in Guiyang. The name of Chang Wang implies pig gut like intestine and solidified blood. With a long history of more than 100 years, Chang Wang Mian has been highly-praised by the people of Guiyang. Another famous Guiyang snack. Beancurd blocks cooked on a piece of special-made metal on fire. The finished bean curd tastes excellent! You can also give it a try to street stands that can be seen everywhere. You may by surprised by their local features. Besides what mentioned above, foreign flavor like KFC, Pizza-Hut, Papa John’s as well as some Japanese and Korean restaurants are also available at downtown Guiyang. · Jiaxiu Pavilion: A landmark and symbol of Guiyang, it is situated on Fuyu Bridge over the Nanming River. Originally built during the Ming dynasty in 1598, the tower is not only magnificent and unique but also of great cultural significance in Guiyang. It was built to encourage the scholars studying for the honorable imperial examination. The tower is a three-storey building rising 20 meters (66 feet) high. It is an elaborate combination of green tiles, red pillars, engraved windows and white stone parapets. It is even more beautiful at night as it lights up with lanterns. Most visitors come to see the exhibitions of the calligraphy pieces, woodcrafts and stone tablets inscribed with poems. · Qianling park（黔灵公园） :Large of 426 hectares, the park is very easily accessible from downtown and is made up of forest-covered mountains, Qianling lake, the majestic Hongfu temple (Zen Buddhist temple), Kylin Cave, etc. It is also famous for its large population of macaques (more than 500 individuals) which roam about the park. · Wenchang Pavilion（文昌阁）: It and the old city walls around it have been beautifully refurbished and the pavilion now houses a very popular local teahouse. · Guizhou Museum: It covers local history and customs with some 30,000 cultural relics and more than 10,000 animal and plant samples. It is presently being renovated to better accommodate the large collection. · Walk along the Nanming River: The riverside is paved and is lined with trees and plants and a walk along it, is a simple yet relaxing way to discover Guiyang. Some of the most interesting views are around the Jiaxiu Pavilion. On the border of Qingzhen and Pingba Counties, Hongfeng Lake is a state-class scenic spot. Scattered throughout the lake are 178 islands. Hongfeng Lake is divided into four parts with different characteristics, including the North, the South, the Middle and the Rear Lake. North Lake is known for a lot of gorgeous islands; the South is famous for many unique caves; the Middle is characterized by its wide glittering water; the Rear boasts many elegant bays.